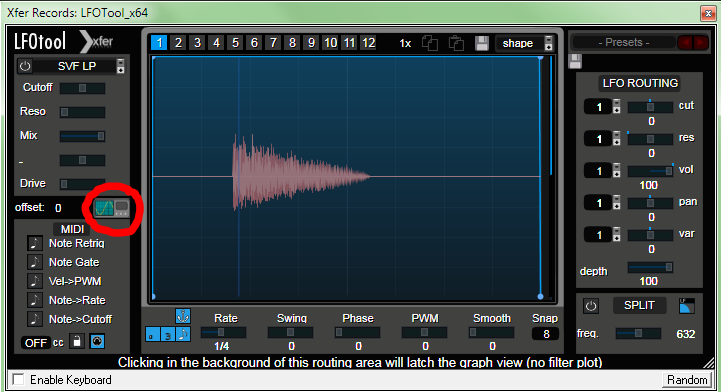 Fantastically useful for visual feedback on compression and even just peak volume differences. Just to be clear both outputs would be a rendering of the audio on the track (one before any fx are applied and one at the end of the chain before the master track fx), so it doesn’t make a difference if it is a VST or a sample, it’s just the output you see. So if you have an Sxx command then you would see the audio rendered as it sounds, i.e. from the correct place. I don`t think you could do what you wanted with that, as in sampler-style scanning parts of a sample. Yes that would be great, just like Ledger said! Yes more options around this would be good! The first oscilloscope must analyze the resulting wave without any effect and in real time. The second oscilloscope should do the same with all kinds of effects. It would be to analyze the wave in the PRE DSP Chain and the wave in the POST DSP Chain. As it is only a piece of wave to show, it may not require many resources, but supposedly should have a horizontal zoom. To what limits? Because this would be crazy for a whole clue. I suppose I could be limited in time, 5 or 10 seconds. But I suspect that this can have a direct impact on performance. I do not know to what extent this is feasible. I can not imagine these new oscilloscopes without a new Renoise GUI that is really fluid. Even some specific native effects can shake the fluency of the playback of the sequence. Yes It’s certainly feasible on modern cpu. If on a machine that struggles then you just wouldn`t enable the view, but I still imagine that you’d need to be maxing out quite heavily for problems to start. To make the mockup I used LFO-tool VST. Here on a Xeon 1231 (haswell gen i7) It use less than 1% running 2 instances. To enable the scope press the circled button on the left. if you want to increase the readout length (up to 16 bars), use the Rate slider on the bottom-left. RE: Rendering up to song length, I guess it wouldn`t be too major of a problem as it only needs to access the current audio ‘chunk’ as any other plugin does. The calculation for previous ‘chunks’ is already done and those results are just rendered to screen and not continously calculated. Similar to showing a long wav in a sampler/ DAW timeline. Suggesting a new native dsp device. “Analyser Send”…like send, but will send signal to scope or spectrum analyser channels from anywhere inside DSP fx chains. I already use it in mixer view, having 2 muted dummy send channels which are wired to the spectrum analyser channels, and then send from anywhere to get spectrum analyser goodness going. Would be cool to do the same for oscilloscope, too, also layering 2 channels to compare the waveforms. edit: though if you wanted to compare different channels/tracks, I see that devices would be necessary.